This last week I spent intensive hands-on study time with the well-known English food and garden photographer, Francesca Yorke. She led a course at the Santa Fe Photographic Workshops for eight of us interested in gardens and food. The course made a sensible progression from making images of flowers and plants along a city street, through visiting some interesting and different gardens, then photographing a bustling farmers market and a garden store, and finally doing some hands-on cooking and photography with Chef John Vollertsen (Johnny Vee) at his Las Cosas Cooking School. Francesca Yorke is a superb teacher who is able to give frank and honest criticism without intimidation or belittlement. She has shot some of the most famous gardens and worked with some of the most well-known food personalities in England, so her experience is rich. Each day she showed us some of her best images, and that provided a wonderful learning experience and inspiration. 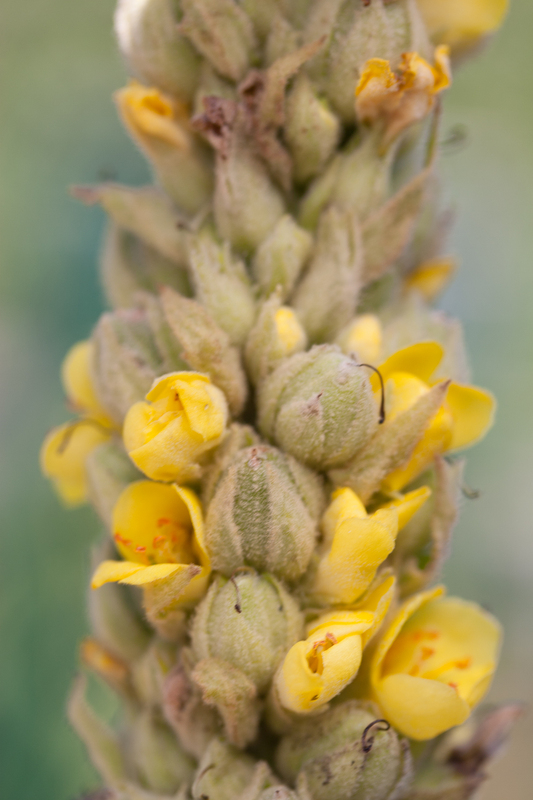 Our first visit was Santa Fe’s famous Canyon Road where we had the opportunity to shoot images of flowers in planter boxes, wildflowers growing in vacant yards, or interesting leaves and berries on shrubs and trees along the sidewalks. Although things had begun to fade in anticipation of the autumn, there was still an abundance of color for all of the student photographers. For a couple of days, we traveled to several gardens in the city and in Albuquerque. Grasses were in abundance, there was interesting statuary aplenty, and some of the leaves had begun to change into the radiant hues of autumn – reds, yellows, and dappled oranges. In one garden, there was a menagerie of piglets, sheep, goats, and chickens so that there were lots of action and human interest photo opportunities for those of us who were getting a little bored with flowers. The farmers market was a busy place with vendors selling all sorts of fruits and vegetables, chili roasters going full blast, and lots of people who made for terrific photo opportunities. The garden store, too, was a great place for photos not only of flowers, but also of pots, watering cans, prowling insects, and tools. 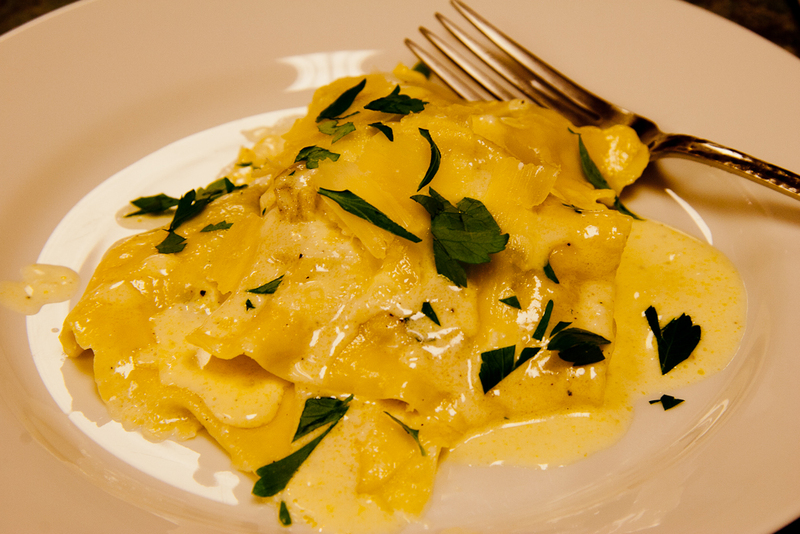 Every day we took time out for lunch at restaurants which Francesca had chosen to reflect good cooking and good eating. Then she took us to her studio where we practiced food styling with a cornucopia of items she had purchased at the local store. We used her collection of bottles, jars, cutlery, bowls, plates, and linens to try our hands at creating photo images that would be suitable for a magazine article or for inclusion in a cookbook. While none of us succeeded in that goal, there were plenty of great shots. Fran looked over our shoulders with helpful suggestions without being intrusive. The last day was clearly the highlight of the whole experience. We traveled to Las Cosas kitchen store where we were met by the enthusiastic Chef Johnny Vee (John Vollertsen). We took turns cooking and photographing a meal prepared from recipes in Johnny’s cookbook, “Cooking with Johnny Vee” (Gibbs Smith Publisher). The menu was simple but interesting – garden herb focaccia, farmer’s market salad with tomato confit and goat cheese “truffles”, artichoke ravioli with lemon and Parmesan cream, and strawberry buttermilk biscuit shortcake. Everyone participated in the cooking so we all pronounced it delicious. And it was! Then back to the workshop where we viewed the best of the best images from the class. There were some amazing photos. Francesca had done her job, and the class departed with newly honed photographic skills and a new set of photographer friends. A while back, I wrote about some of the favorite foods we shared during our annual family rendezvous in Big Sur. 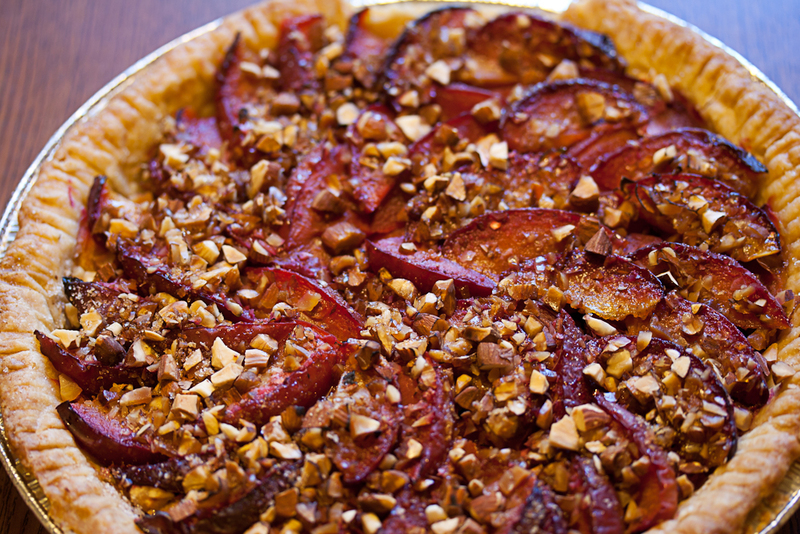 Someone asked for the recipe for the plum tart . This is the tart that Sarah made for the adults at our family cookout. Choose whatever sweet plums suits your fancy, although they should be free stone so that you can slice them easily. Use your favorite pie crust recipe, and bake the shell “blind” to receive the filling. The tart is best when topped with crème fraîche, whipped cream, or ice cream. Line a nine-inch pie pan with your favorite pie crust recipe. Crimp the edges, pierce the bottom several times with the tines of a fork. Line with aluminum foil, and fill with beans or pie weights. Bake for 15 minutes in the middle of a 375° oven. Remove from the oven. Remove the weights and foil and cool on a rack. In the meantime, slice the plums and set aside. Combine the sugar, spices, and zest with a mortar and pestle to release the orange oils. Then toss with the chopped walnuts. Scatter ⅔ of the walnuts in the bottom of the pie shell. Cover with the plum slices, arranging them so that some of the skins are showing. Scatter the remaining walnuts over the top of the plum slices. Bake at 375° for about 35 minutes or until the plums have begun to release their juices. In a previous post, I wrote about some of the good family food and eating experiences that we enjoyed during our recent family rendezvous in Big Sur. This time, I want to describe some of our favorite restaurants. 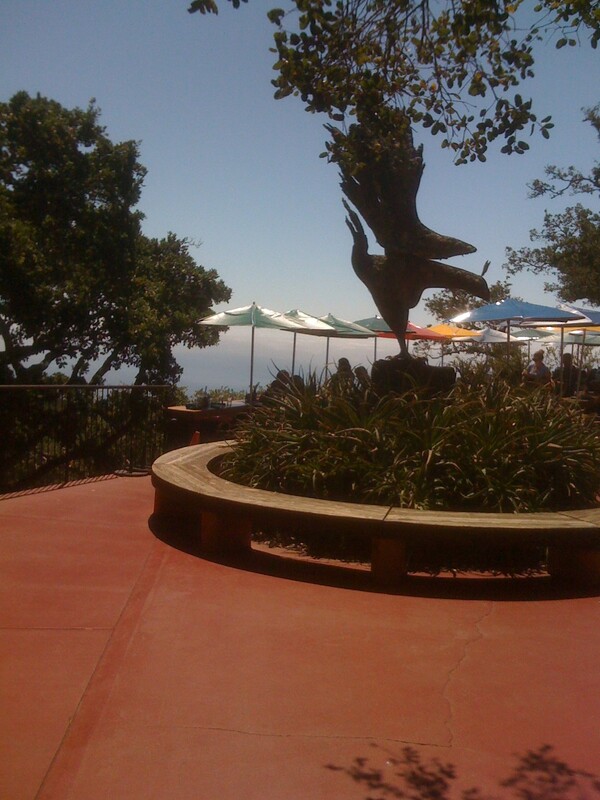 There is no lack in Big Sur of good eating choices for every budget and for every time of day. We certainly haven’t tried them all. So often we are on our way to something else and the time is not right. But we have also become creatures of habit, so we come back to our old standbys. 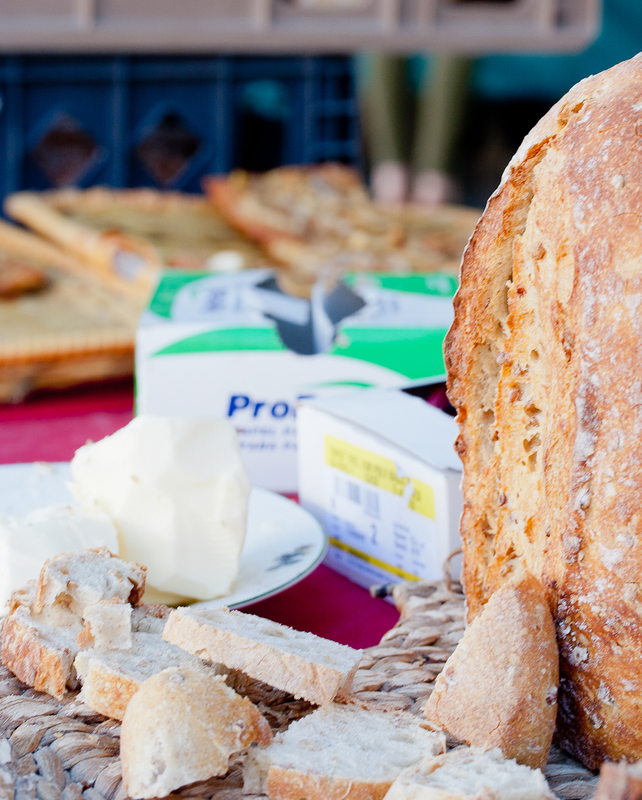 Without doubt, the place we visit the most is the Big Sur Bakery. We used to make elaborate home-made breakfasts in the cabin – pancakes, omelets, scrambled eggs and bacon – but no more. Every morning we head to the Big Sur Bakery, often with the younger ones chanting in the background what has almost become a mantra, “Big Sur Bakery! Big Sur Bakery!” The obvious reasons for this change of allegiance are first there is nothing to clean up except for busing your table when you are finished and second the pastries and breakfast dishes are unbelievably delicious. My very favorite is the ham and cheese croissant, but the daily fritatta runs a close second. 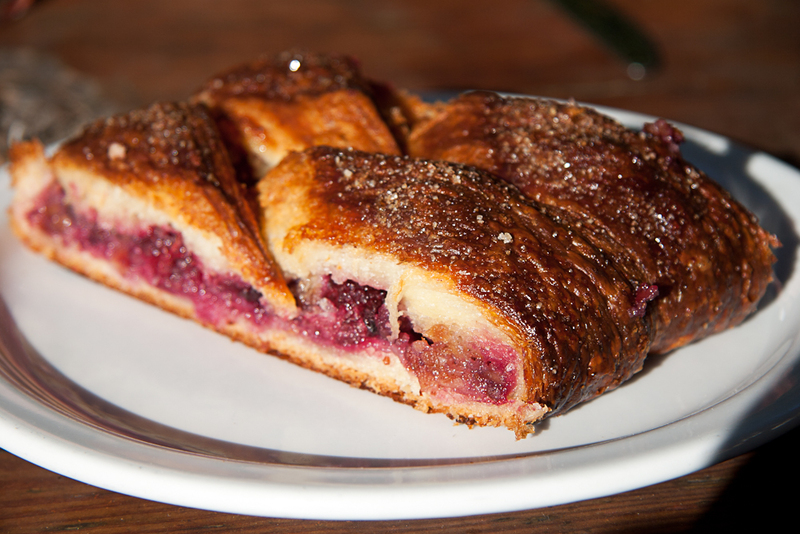 For those with a sweet tooth, the berry strudel is a pleaser. The pain au chocolat (chocolate croissant) is a popular choice for kids. The citrus bun is also popular with everyone. Beverages are also varied and creative. The barista spends as much effort with the kids’ hot chocolates as he or she (depending on the day) does with the lattes. There is a whole wall full of choices for hot tea, or you can get iced tea or fresh fruit juice. 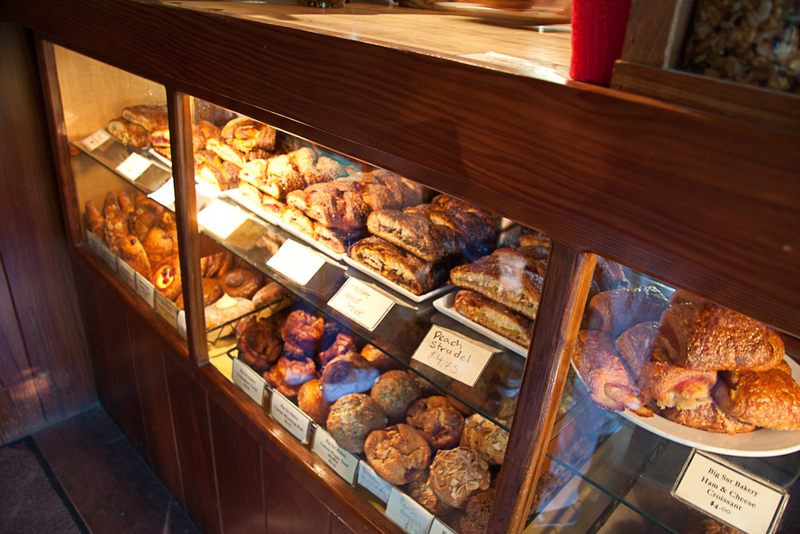 When we first started going to Big Sur, the bakery was popular, but now it has clearly been discovered. If you arrive at 8 AM there is likely to be a line waiting for the doors to open. If you arrive too late – say around 11 – there is a good chance that they will have run out of your favorite. If that happens, hang around for lunch or dinner because their offerings for those meals are creative and delicious. The Big Sur River Inn is a popular family gathering place for lunch. By noon, the fog has almost always burned off so that the deck is warm and sunny. 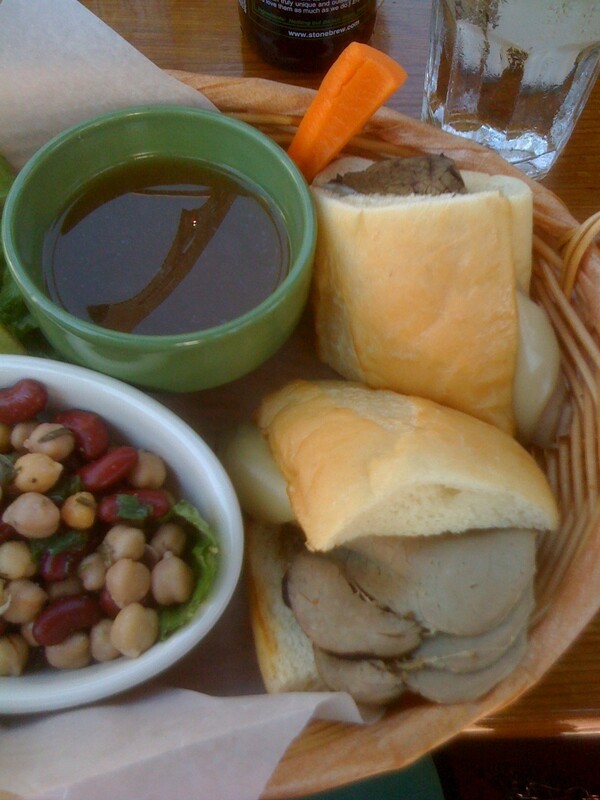 The choices are all pretty much American – burgers, sandwiches, interesting soups, and salads filled with just about whatever you might want – but they are well prepared, tasty, and generously sized for the price. For the kids (as well as their parents) an unusual advantage of the River Inn is that you can choose to sit in the river. That’s right! There are Adirondack chairs in the middle of the river running behind the restaurant where you can sit and cool your feet in the rushing water while you are waiting for your lunch. The place serves dinner, too, and often has live entertainment later in the evening. The River Inn is at or near the nerve center of the Big Sur because it has one of the best grocery stores with a selection of wine, beer, and liquor and it also is nearby several motels and campgrounds as well as Big Sur’s version of a shopping mall: three or four little shops with clothing, curios, and other odds and ends. 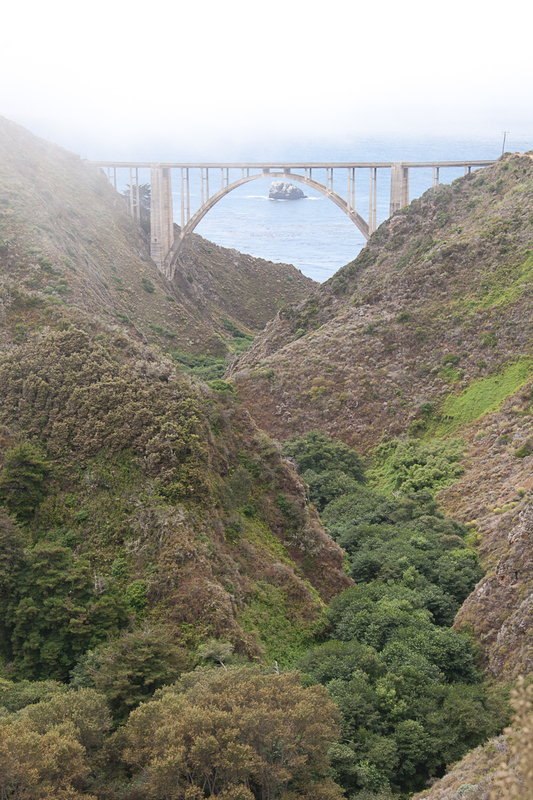 Nepenthe is quintessential Big Sur. It has been in place for a long time, and to prove it there are pictures around of customers relaxing during the days of Jack Kerouac and before. That means that a lot of today’s older visitors remember the place from their “Hippie Days”. The big attraction is the view, and it is at its best after the fog has gone and before the sun has set, so clearly lunch is a popular time. Arrive when they open, and you will probably be able to get a table outside with a view. Things fill up fast, so you may need to wait, but there are some comfortable waiting areas outside. The food is good but not amazing. 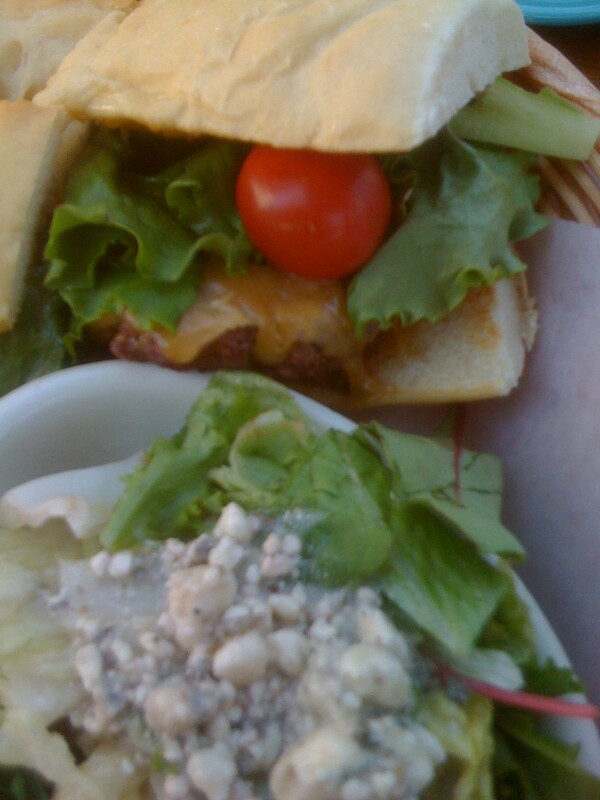 The “signature dish”, if there is one, is the Ambrosiaburger topped with a special sauce. The French dip sandwich is straight out of the sixties and reminiscent of the one my mother always prepared for my kids during their visits. The bean salad is much more complex than the three-bean salad you have probably had a hundred times before. It has an herbal taste that complements whatever you have with it. The soup of the day is always unique. One of my favorites is the curried apple. The name may not sound too exciting, but the soup is outstanding. There are other very special places including the Post Ranch and Ventana. Those have spectacular views, elegant dining rooms, and amazingly sophisticated foods for being so far from the big cities. For them, you might consider dressing a little better than the usual Big Sur casual, and you should definitely be prepared when the check arrives. Still, the experience makes it seem very much worth it. This list has only scratched the surface of the restaurant experiences that are available to you in Big Sur. Much of the fun is exploring the possibilities on your own. 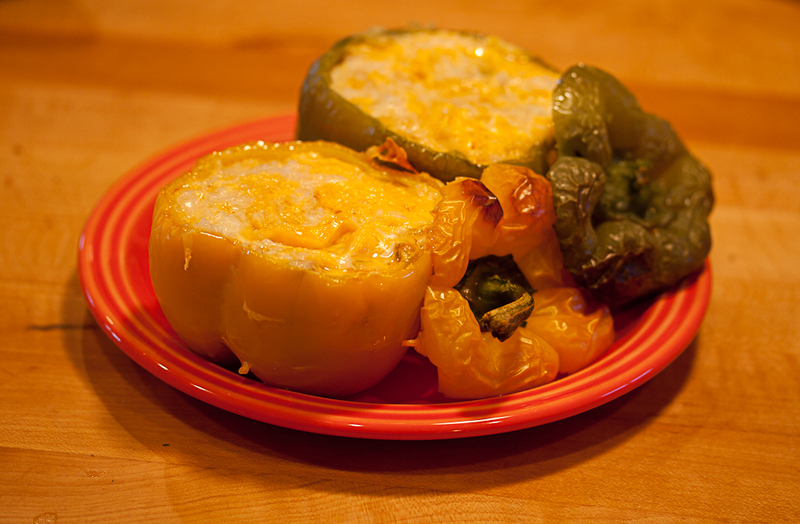 The first touch of autumn is definitely here, and the bell peppers are abundant at the local farmers market. They come in the standard-issue green along with yellow, orange, red, and variegated colors. And they are big and just begging to be stuffed with your favorite filling. My mother always used her favorite meat loaf mix. That’s pretty much the traditional approach, but you can branch out with whatever filling pleases you, such as rice, mixed vegetables including fresh corn, or even shrimp or crab. Suit yourself, but enjoy one of the real treats of the fall season. This recipe is easy to make and uses Italian sausage to provide not only the protein but also aromatic Italian seasonings. Depending upon your preference, choose hot or sweet (mild) sausages. 1. 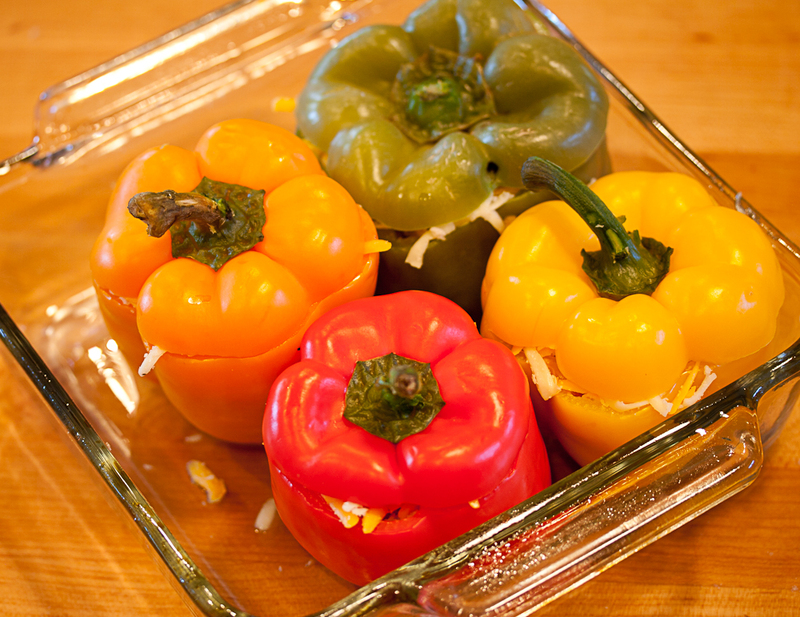 Prepare pepper casings by slicing off the top to form a cap. Reserve the caps. Remove the seeds and ribs of the peppers. Place in boiling salted water, return to the boil and boil for 10 minutes. Remove, drain, cool, and set aside. 3. Transfer the sausage mixture to a medium bowl and combine the brown rice, eggs, panko, tomato paste, cream cheese, and half the Swiss cheese. Salt and pepper to taste. Stir until well combined. 4. Spoon the stuffing mixture into each of the pepper casings. Sprinkle the tops with the remaining Swiss cheese and panko and dot with butter. Cover with the reserved caps and place in a baking dish sprayed with vegetable oil spray. I have been away for a couple of weeks, enjoying our annual family rendezvous in Big Sur. For the last six years or so, we have met at the Pfeiffer State Park, each family laden with food, snacks, and wine. Unfortunately, our son and his family could not join us this time because of school obligations. Those seem to increase as children get older. But the others came prepared for a week of hiking, playing on the beach, enjoying one another’s company, and getting caught up on events since we last saw one another. One of our traditions is to bring lots of the family’s favorite snacks – “Texas trash” and old-fashioned Southern cheese straws. The Texas trash is our version of the chex mix recipe that you can find on the back of a box of wheat chex. We add a few more items like different nuts, funny pretzel shapes or whatever and more butter. You can be as creative as you like. The cheese straws come from Craig Claiborne’s classic cook book, ”Southern Cooking”. The only thing we do a little differently is to put the dough through a cookie press into the form of five-petal flowers. That shape has been obligatory for as long as I can remember. It has the advantage for the eater of being able to just bite off one petal at a time. That way you feel more virtuous even though the recipe calls for practically nothing but butter, cheese, and just enough flour to hold everything together. This year, we gathered while my older daughter prepared one of her old standby recipes – “Law School Chicken”. 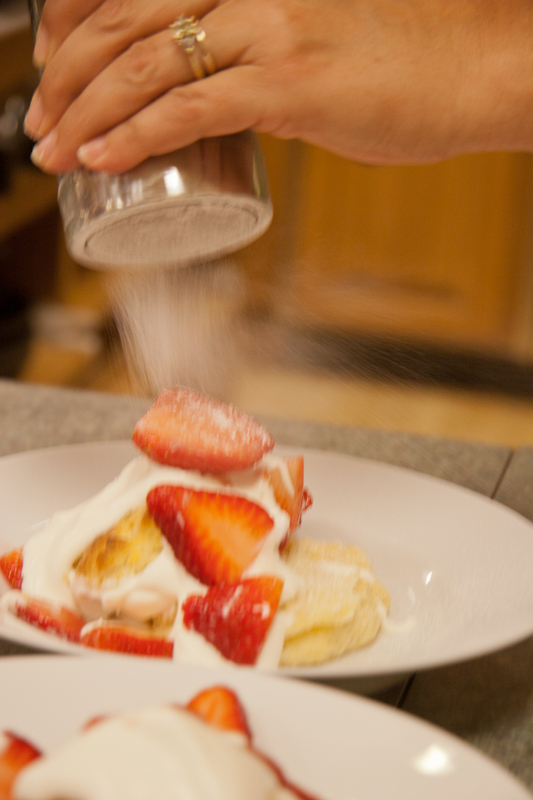 She developed the recipe while she and her husband were both in law school. It was a cheap, easy-to-fix one-dish dinner that could be served to company. It was also a welcome change from instant ramen. Carol says it is easy to make. First, she dusts some chicken breasts with flour and sautés them in a little butter and oil until they are cooked through and browned and crispy on the outside. While the chicken is cooking, she caramelizes some fresh peeled peach halves along with some slices of red and white onion. She boils some couscous in chicken stock with just enough of the stock left over to moisten everything. A good squeeze of fresh lemon brightens the taste. When everything is done, she serves the chicken over the couscous, peaches, and onions and completes the meal with a green salad. Delicious. It is so good that, unfortunately I got busy eating and forgot to take a picture for you. Nevertheless, you get the idea. Give it a try. I think you will add it to your list of tasty meals to make when you are in a hurry. The next night we had our traditional cookout with steaks, roasted corn on the cob, beverages, and of course, s’mores over the campfire. This year, though, we did it differently, and I would highly recommend our new approach. In the past we have had big steaks for all of the adults and a shared steak for the children. While that sounds wonderful, the problem is always that the steaks have to be grilled in batches because the grills available in the picnic grounds are too small. Some turn out to be too well-done while others are too rare, and some of the adults have finished eating before others have even started. 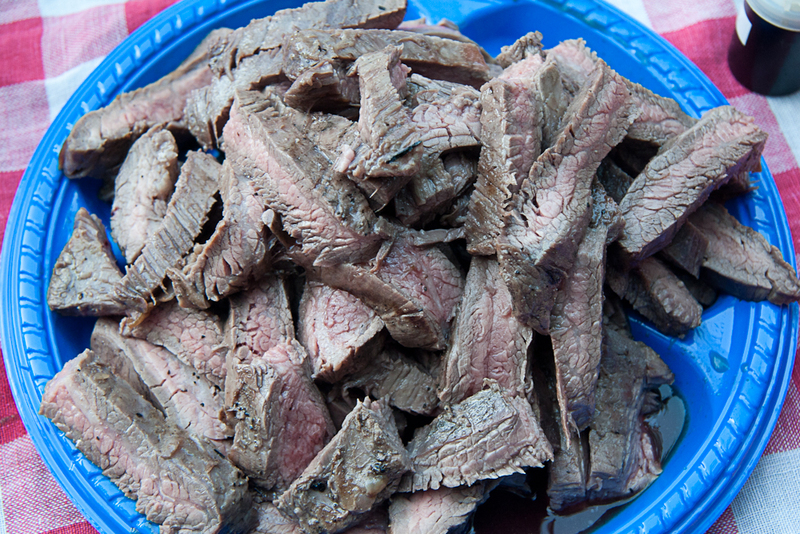 This year my younger daughter suggested flank steak – which turned out to work beautifully. We bought two large flank steaks for six adults and three children, marinated them all day with olive oil, vinegar, salt and pepper, and then grilled them over a charcoal fire. My son-in-law, the chef, grilled them to perfection, sliced them, and served them to everyone at the same time. Another change this year was to use charcoal for the main cooking and to save the campfire for later. 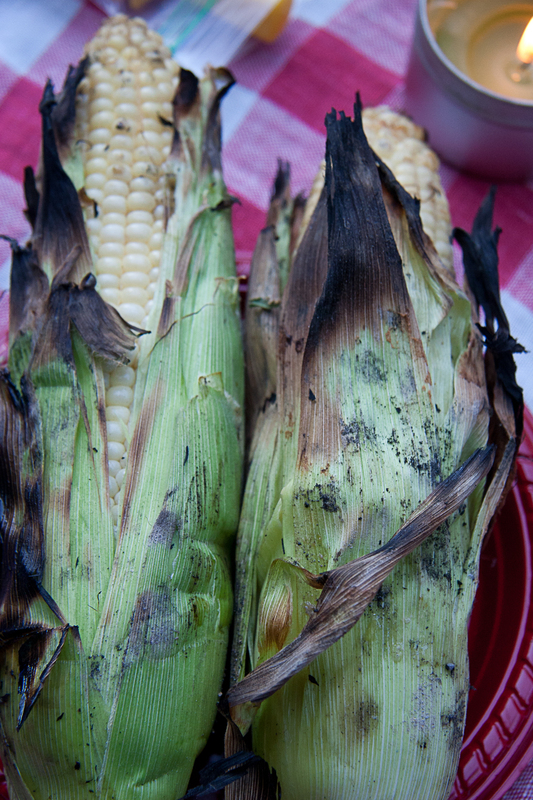 The charcoal gave us an even fire and also let us put ears of fresh corn in the coals. In preparation, we removed all of the silks from the corn while keeping the husks intact to fold back over the individual ears. All got their fill, so it was soon time for s’mores. We put a log on the charcoal fire, waited until it flared up, and then made classic s’mores with toasted (burned) marshmallows, chocolate bars, and graham crackers. If you have not eaten one of these fabled treats for many years, trust me: only kids can eat one of these sugar bombs, So dessert for adults was a delicious plum tart that Sarah had made with fresh plums from a friend’s back yard. Lunch the next day included a delicious quiche from Sarah. She made a jam from tomatoes that we had brought her from our garden. 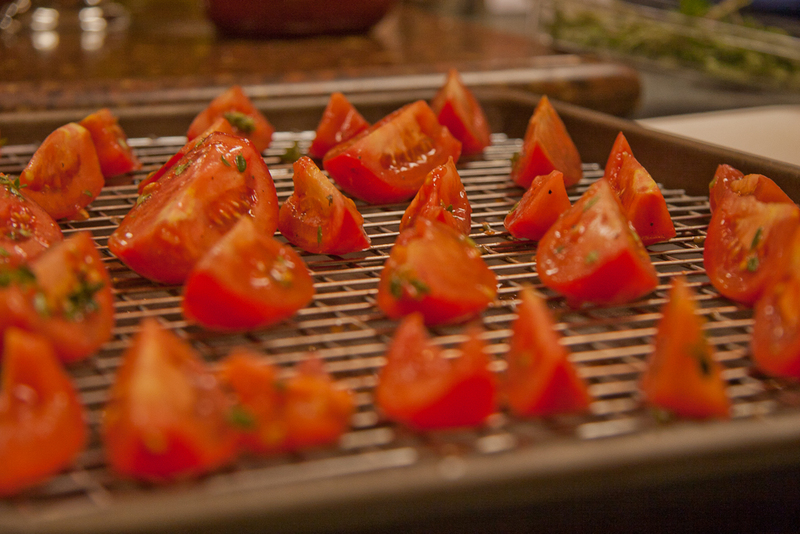 She peeled and seeded the tomatoes and then cooked them down with flavorings into a beautiful jam. 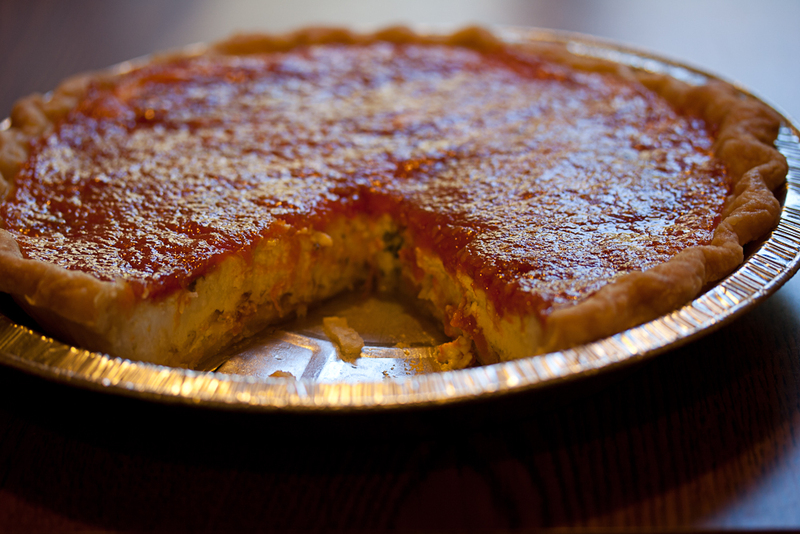 She then ; made a pie shell using a favorite recipe of my wife, Susan, and filled it with a thin layer of caramelized onions, topped it with a custard of cream, eggs, farmer’s cheese, and basil, and baked it. After it had cooled, she covered it with the tomato jam. Beautiful to see and wonderful to eat. Add the flour and cheese to the bowl of a food processor. Cover and pulse together until well combined. Add the butter, salt, Cayenne pepper, and Worcestershire sauce. Cover and process until the mixture comes together as a ball. Stop the processor and knead the dough briefly to bring together any loose particles. Wrap in plastic wrap and let set at room temperature. Do not refrigerate. Divide the dough in fourths or enough to fill a cookie press fitted with the patterned plate of your choice. Push the dough out as individual “cookies” on two ungreased baking sheets. Place the baking sheets in an oven preheated to 300° and bake for 20 minutes until the cheese straws are crisp and slightly browned. Bake longer if you wish them to be darker, but be careful as they burn easily. Transfer to cooling racks. Store the completely cooled cheese straws in the refrigerator in an air-tight container. 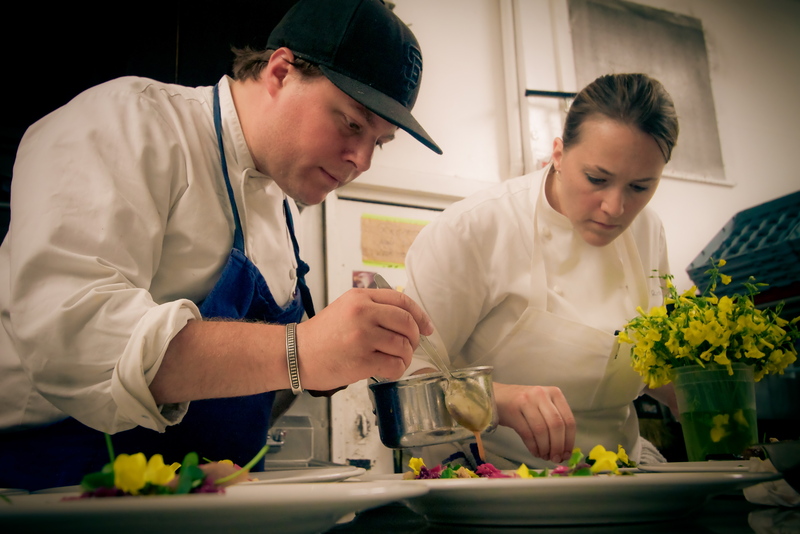 While I was in California the last two weeks, I got to see my daughter and son-in-law’s pop-up dinners first-hand. Not only did I get to give them a little help prepping (We just need to humor poor old Dad.) but also my wife and I got to enjoy the meal that they had prepared. Once again, the dinner was held on Monday night at the restaurant, Radius – a night when the restaurant was usually closed. The space is modern and sparely furnished and located in SoMa, so it attracts a younger crowd, and there were plenty in attendance at the pop-up. The waitstaff were all very capable and friendly. Most of them had known my kids from other venues around town and had volunteered to help on their nights off. Of course, as parents of the chef, we were welcomed warmly, but to my eye, everyone was receiving the same attentive service as we were. The warm-up was a flute of California sparkling wine, Roederer Estate Brut, Anderson Valley, to go with a plate of nearly transparent rice crackers sprinkled with crunchy poppy seeds. 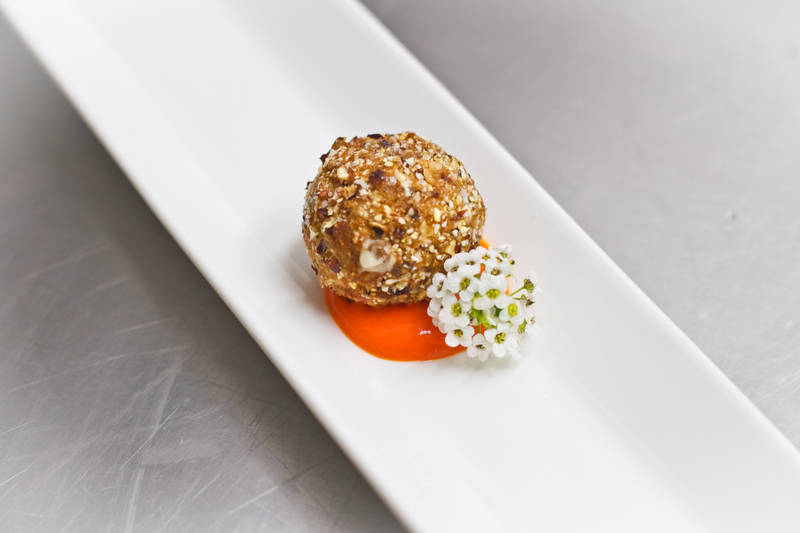 Then along came a beautiful amuse bouche of bite-sized corn fritters, nested on a creamy smooth red pepper coulis. The fritters were filled with fresh corn kernels and a creamy filling. They were crispy on the outside because of their coats of artisanal heirloom cornmeal. Next came a bright salad of tender beets topped with little clouds of goat cheese that had been whipped to an incredible lightness. 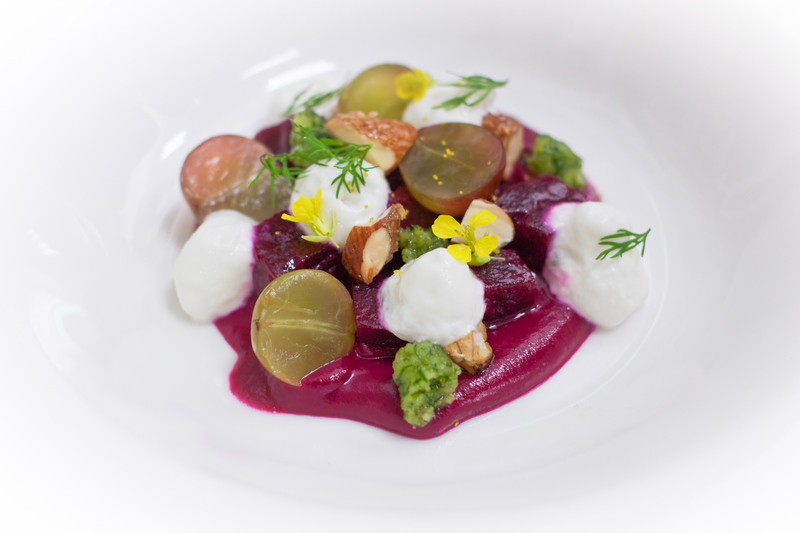 Flame grapes were displayed along the edges, and snippets of fresh dill fronds made the classic combination of beets and dill. The palate cleanser then made its appearance: a tiny little bowl of gazpacho which had been gelled and infused with air to practically float on the spoon. 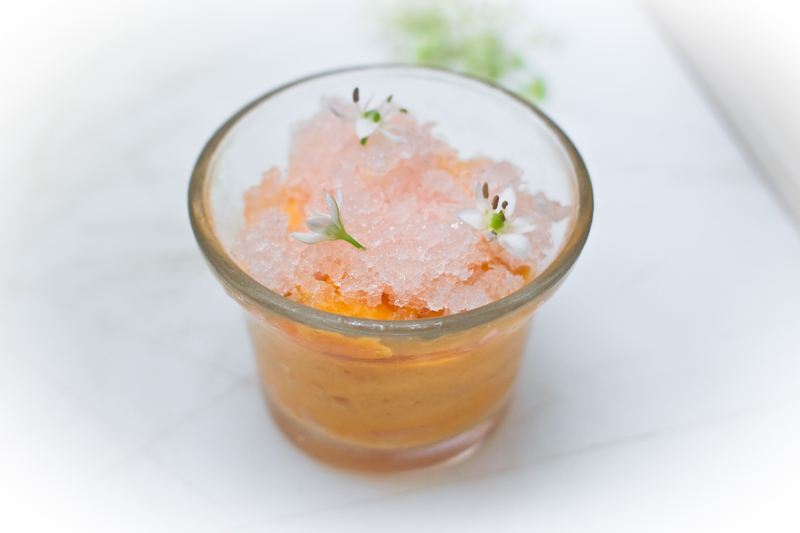 An icy granite topped the gazpacho, and garlic flowers on top provided the extra bite that made this dish memorable. 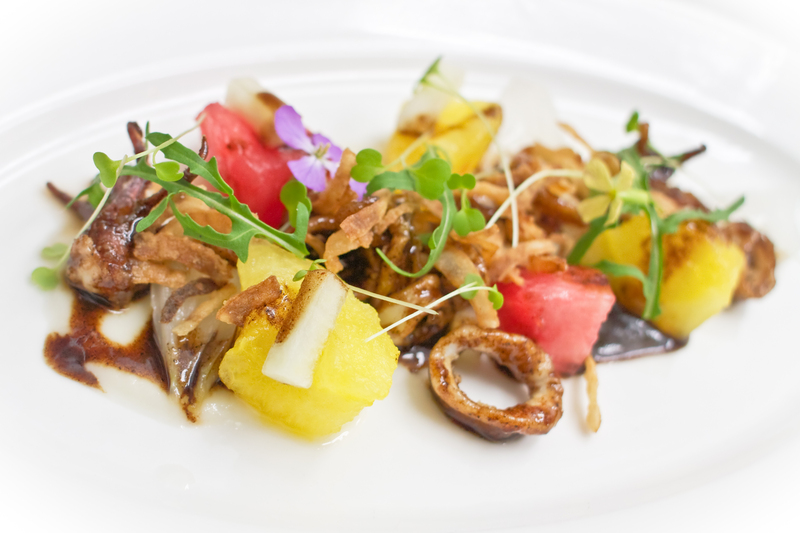 The fish course was composed of perfectly sautéed bites of squid in a black olive vinaigrette and accompanied by the sweetness of red and yellow watermelon and the savor of crispy onions. 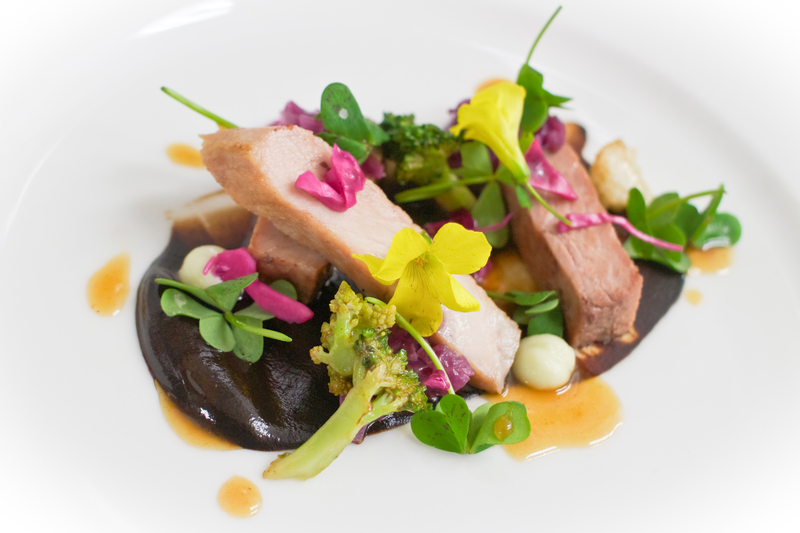 The meat course picked up the theme of black with tender, aromatic slices of roasted pork shoulder set in a pool of black garlic puree and covered with a bouquet of edible flowers. 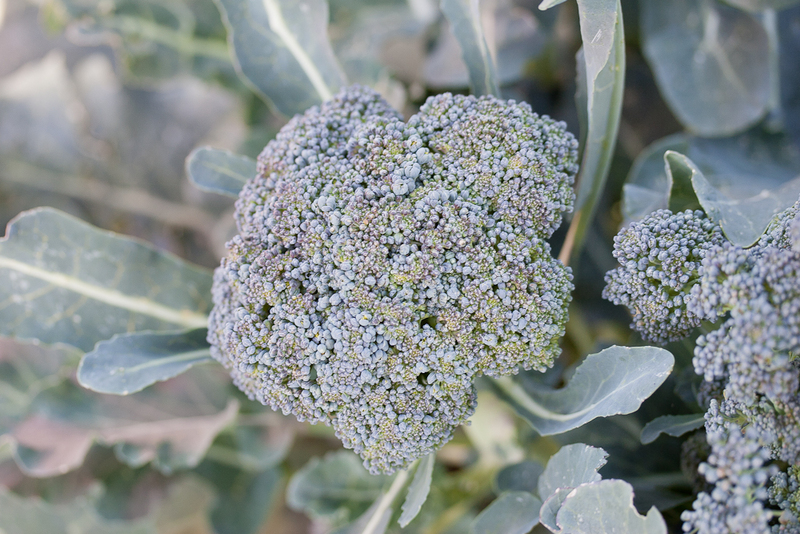 Bites of white cauliflower and tiny little heads of Roman broccoli completed the dish. It came with a tray of fennel-pollen-scented baguette. The bread was clearly intended to sop up any extra black garlic. One of the guests at the next table asked for extra bread to make sure his plate was completely clean. Dessert was labelled as “peach cobbler” on the menu, just to let you know it wouldn’t be your mother’s peach cobbler, and it wasn’t: a delicate panna cotta flavored with baked pie crust, laced with bits of fresh peaches, topped with a streudel that included crunchy bits of corn to return to the theme that started the whole evening. Then, as if that wasn’t enough, we finished with two beautiful red curls that combined the earthiness of red pepper with the sweetness of candy. It reminded me of the fruit leather of my childhood, but with a sophisticated taste and texture that left those memories far behind. All in all, it was a wonderful restaurant experience. I also need to give special credit to two of Sarah and Evan’s friends: Daniel Brooks made these beautiful images while I was busy eating. 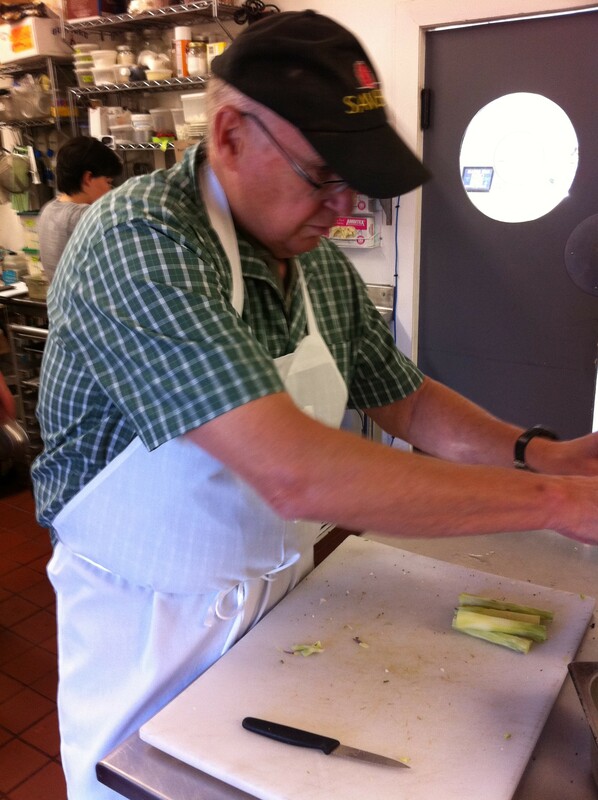 Danny is also a private chef in the San Francisco area. Jamie Law has been a constant friend who continues to provide amazing help in publicizing these pop-up events. Sarah and Evan will be doing more pop-ups in the near future. 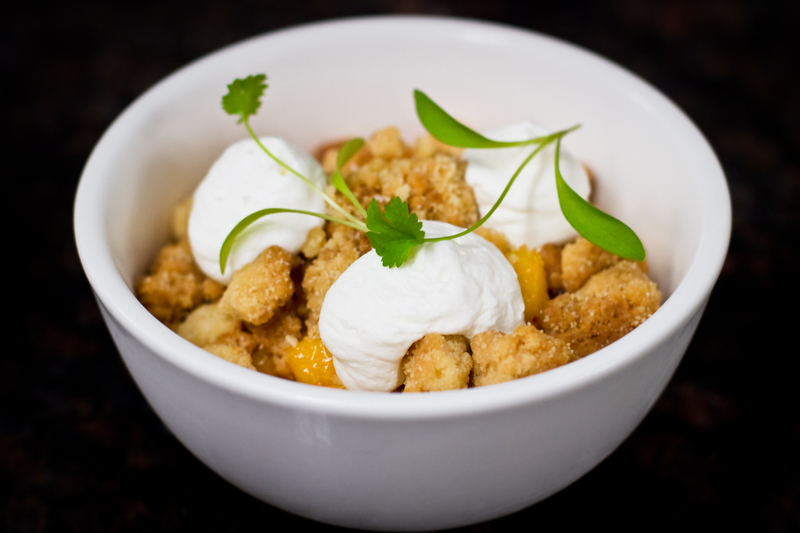 If you would like to see the menus or reserve a place, you can check out their Facebook page: http://www.facebook.com/ChefsNightOff or you can email them at chefsnightoff@gmail.com to be put on their mailing list for upcoming events and menus.